One look at Good Charlotte and one might take a second glance. The band, led by identical twins Benji and Joel Madden also includes Paul Thomas the bass player, Billy Martin on guitar, and Chris Wilson on drums. 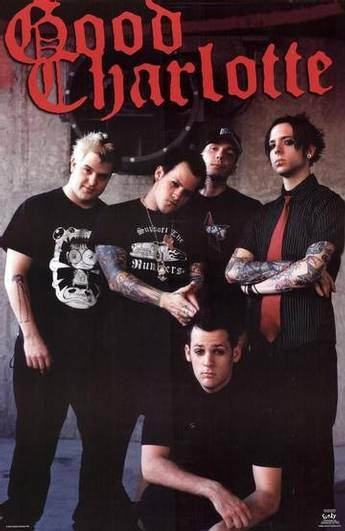 The guys decided to name the band after a children's book called "Good Charlotte. Joel, lead vocals, and Benji, backup vocals and guitarist, were inspired to start the band after attending their first rock concert, the Beastie Boys'. Paul, a school friend, taught Benji some basic chords on the guitar and Aaron, another school friend, played drums and lent his house as studio space. The bands first practice was a week later. In 1998, all four guys (not Billy) moved to Annapolis, deciding to skip college and risk their schooling for a serious music career. The boys worked as stock boys, waiters, and shampoo boys at a beauty salon to earn money as they began to build their fan base in the Baltimore/DC area. Billy didn't join until he showed up to see the twins play an acoustic set at a local hangout. Although Billy was in another band called Overflow, the twins moved into Billy's house when they were kicked out of their apartment and Billy joined a practice, then a show with the guys. Although unsigned, Good Charlotte began to play with Blink 182, Bad Religion, and Lit. They continued to gain fans, playing for charity and the local radio station WHFS' HFSTIVAL, first on the local's only stage, and then in 2000, to the street stage. The band's popularity spread when a demo of "The Little Things" was picked up by Philadelphia's Y100 and broke a record on the station's show as it was chosen for 15 nights over other competing songs. Soon the band was offered record deals, and they signed with Epic Records in 2000. GC's producer Don Gilmore helped the band through their first album, which was a dream come true for the boys. The twins write all of the band's songs, from political issues, to love, to growing up. MTV picked up the first single off of the album "Little Things" and played it on MTV and MTV2 along with GC's second single "Motivation Proclamation. Benji and Joel guest-starred on a popular MTV show and the band was asked to write/perform the theme song to the MTV show "The Undergrads". The next single was "Festival Song" inspired by the HFSTIVAL, which gave GC their first big break. The boys played at the 2001 2-day festival, first on the street stage and then on the main stage for the first time. The video was also filmed at the Festival. Aaron left the band to join his brother's band, Wakefield, and the other 4 guys say that they talked it over and came to that decision together. Recently Good Charlotte's newest member, Chris, has become their full-time drummer. "He's our real drummer, says Joel. "We've been writing new songs and we're all gonna go into the studio together, as a proper band and make a new record", adds Benji. We'll all hold them to their word.